Dogwoods, Living Christmas Trees, Japanese Maples, Rhododendrons, and other Oregon stock arrived yesterday. We have White, Pink, and Cherokee Chief (Dark Rosey Pink) dogwoods in now. Just arrived. Also just got in some Exbury Azaleas (deciduous azalea), Tulip magnolias, some very nice Japanese Maples, Rhododendrons, Mugho Pines, and other Oregon Stock. 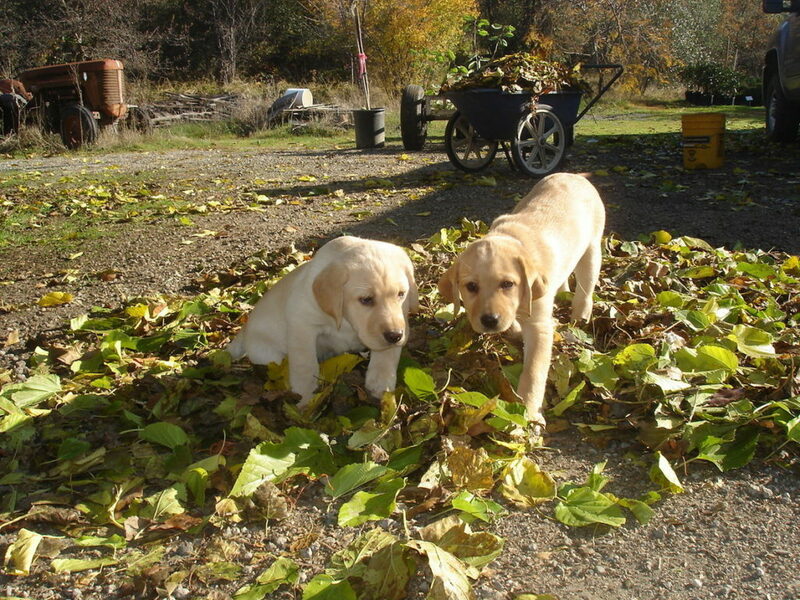 And below is a picture of Chester and Jessie when they were about two months old. Now they are 9. Not plant related but very cute puppies. Great dogs now. Always happy to see everybody. 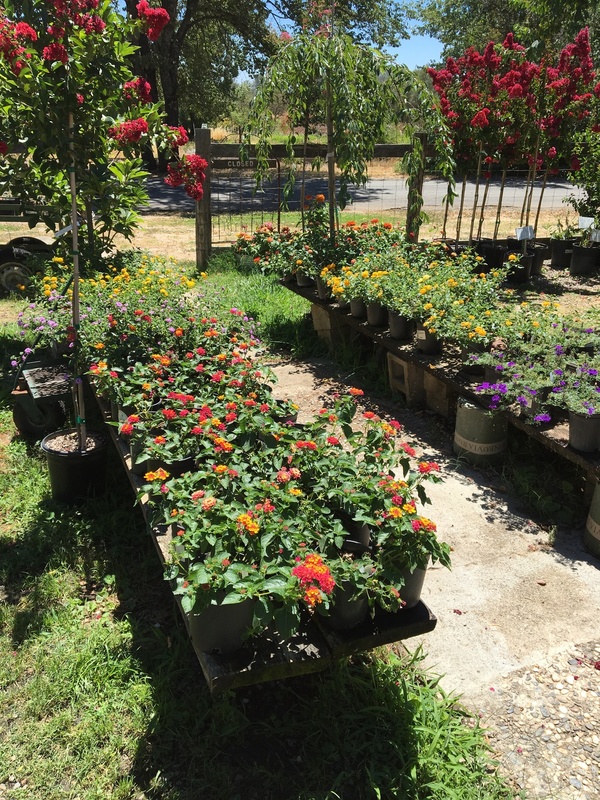 ONE GALLON PERENNIALS ON SALE – $4.95 EA. SEE LIST OF VARIETIES BELOW. ALL IN FULL BLOOM NOW. ADD COLOR TO YOUR LANDSCAPE. PERENNIALS COME BACK YEAR AFTER YEAR AND BLOOM IN THE SPRING AND SUMMER. 20% OFF ALL REMAINING ROSES IN STOCK. This year has been a very nice spring and early summer. Any hot periods have only lasted a couple of days and then it cools back down. Very nice weather for your landscape whether new plantings or established plantings. With summer here and longer days, it gives a lot of time for gardening. I do all my new planting in the summer since I have more time, and we do planting here at the nursery then as well. Do your planting early in the day or in the evening if possible so it is easier on you. Plants will handle the transplant just fine but do make sure you give additional water for the first week or two after planting to make sure it is kept well hydrated. Also be sure to mulch to hold the moisture in the ground. Water the new planting well, and then water in with Superthrive mixed in water. This will eliminate any transplant shock that may occur. Then keep the plant moist but not soggy while it is getting it’s root system established. If you are using a timed drip system that runs for very short periods, you will need to supplement with a hose periodically. A slow trickle for an hour or two works well about once or twice a week along with the drip system. Mulch well around your trees and shrubs to keep the moisture in the ground. Use 3″ of mulch. 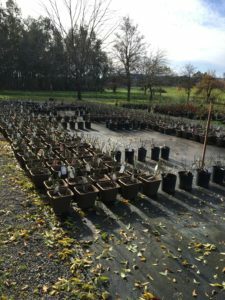 On the subject of watering whether newly planted or established plantings, when there is a spike in temperatures coming, be sure to give a little extra to newly planted shrubs and trees, and make sure established shrubs and trees are well watered going into the temperature spike rather than waiting till afterwards. Sometimes the stress on the plant will be too much if too dry. Signs of not enough water will include crisp edges of leaves, wilting in the heat and perhaps shedding some foliage soon after extreme heat. If you see any of these symptoms, you probably should increase the amount of water or mulch or perhaps a combination of the two. If you see any stress on your plants, treat them with Superthrive mixed with water. This product eliminates transplant shock and also revives plants under stress. 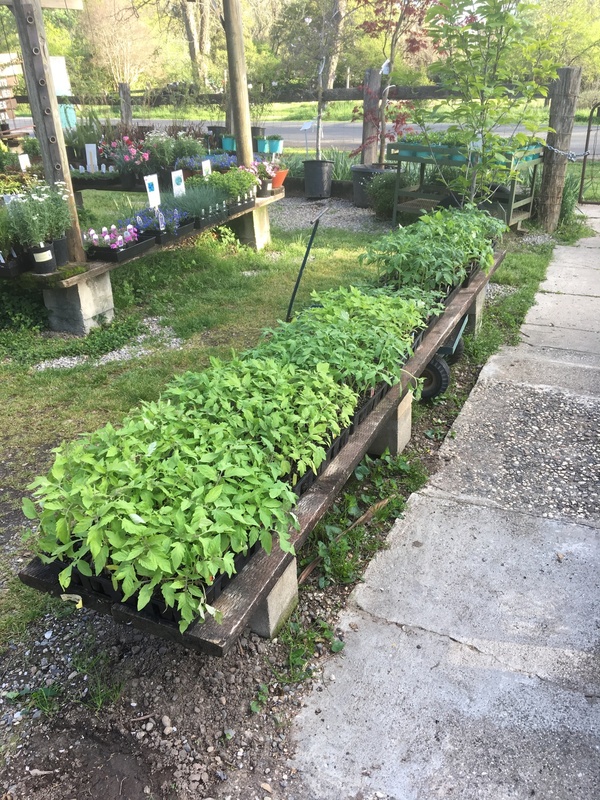 We do all of our transplanting here at the nursery during the summer months and we use Superthrive on all of our transplants and cuttings that we do. Crape myrtles are now starting to bloom here and in landscapes. They are a little slow this year because it is cooler. They love the heat. Although crape myrtle is a very drought tolerant plant, it will bloom much nicer with at least one good deep soak a week. Also spray for aphids if you see sticky shiny leaves. Use neem oil or an insecticide or insecticidal soap. Any of these are better sprayed in the evening so that there is no damage to the leaves from the heat of the day. Vegetable gardens will benefit from a fertilizing about now. 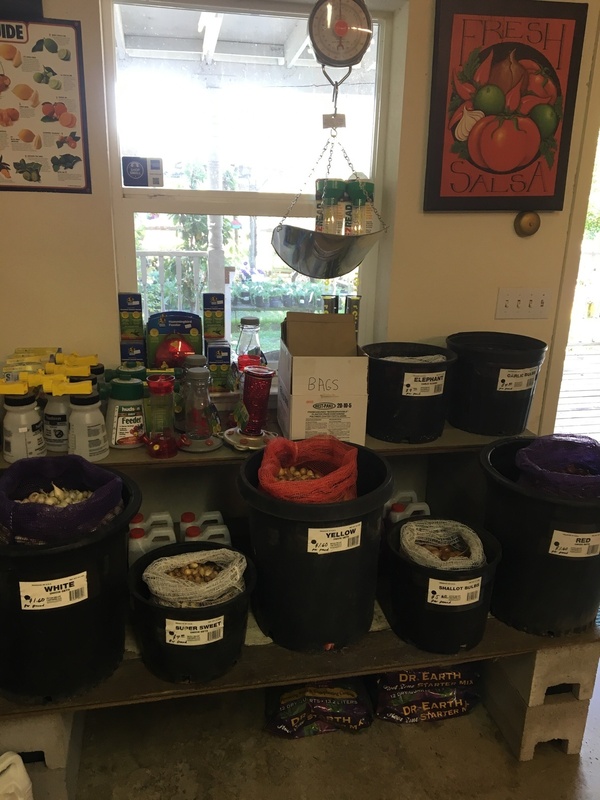 If you fertilized when you planted, it’s about time to give the garden another fertilizing and then again sometime in August to keep your plants healthy and productive. Use a vegetable fertilizer for this. Avoid high nitrogen fertilizers as they will cause growth at the expense of production. Organic vegetable fertilizers work well because they feed slowly and there is less chance of burning the plants in warm weather. Mulch your garden too, to hold the moisture in and use less water. If you are experiencing blossom end rot on your tomatoes and squash, add calcium to your soil. We carry oyster shell and a liquid calcium called Foli-Cal. 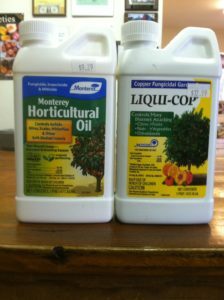 The liquid calcium is used as a foliar spray directly on the leaves of the plants. Watch for tomato worms. If you see them, use BT or Monterey Garden Insect Spray to get rid of them. Both are organic controls. Or just pull them off and get rid of them. Hopefully the weather continues nice and cool for the summer as it has up to this point. Get out early and enjoy the cool of the morning and do some gardening. It’s a great way to start the day. Nice selection. All blooming. Most drought tolerant and deer resistant. We will be doing some landscaping here at the nursery this summer to brighten up the nursery as people drive up. We’ll get it designed and started in the next couple of weeks. Hopefully my plans aren’t overly ambitious. Sometimes that happens. It should look very pretty when we are done. 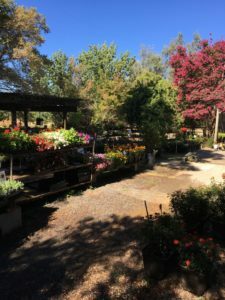 May 2018 marks 33 years in business for us here at Bald Mountain Nursery. My parents, Richard and Cecilia Rice started the business in 1985. Richard Rice (Dad) passed away in 2005. I joined the business in 1992 and have been fortunate enough to raise my son here and have him grow up around the business. He used to be here all the time as a kid and worked here too. Truly a family business. He’s now off on his own and living in Wisconsin. Mrs. Rice (Mom) is still here regularly but starting to take time away more. She enjoys watering and tending to plants but she is not there for writing up sales. She also enjoys and talking to folks. It’s nice that she still enjoys the business that she and my dad started in 1985. This month has not been hot except for a couple of warm days and a little rain and long range forecasts indicate seasonal temperatures for the rest of the month. We have had a beautiful spring this year. It’s a great time to do some gardening and planting. Check your watering systems and make sure all drippers and sprinklers are working. Don’t want to find out a dripper is not working when you see a dead or dying plant. Remember to mulch around your trees and shrubs. This will reduce your water usage by as much as 50% and your plants will withstand the warm days much better because the moisture you apply stays in the ground and does not evaporate. Two to three inches of mulch is what you want around your trees and in your planting beds. Also mulch your vegetable gardens. Saves water and gives you healthier plants and cuts down on the weeds. If you did not fertilize in April, do it now. Many plants were under stress the last few years due to the dry seasons we have had. With the rain this year and last they are doing well and fertilizing will really help them grow vigorously and prepare them for the summer when it gets hot. With this year being 33 years in business and 26 years in this business for me, we want to thank all our customers for your support and patronage. We will continue to strive to offer quality fully acclimated plants appropriate for our climate area at a good value. We’ve gotten through recession and drought and we are still here thanks to the support of our customers. We plan to be here for many years to come. Maybe we’ll get to 64 years. That’s a way’s out. I’d be pretty old to be working still but you never know. Mom is still at it. She is an inspiration. Due to the rain, the Saturday Organic Vegetable Gardening Class is rescheduled for next Saturday the 14th. Class for Sunday the 8th is still on at 10 AM. With the weather forecast for 3″ of rain Friday into Saturday this week we are rescheduling the Organic Vegetable Gardening Classes. Saturday the 7th is cancelled. Sunday the 8th is still on at 10 AM. Saturday the 14th we will have another class at 10 AM and also Sunday the 15th at 10 AM. There is no charge for the class and no need to register or sign up. Just attend the class that fits your schedule. WE ARE EXTENDING BARE ROOT SEASON FOR TWO MORE WEEKS. WE STILL HAVE A REASONABLE SELECTION OF FRUIT TREES AVAILABLE BARE ROOT. DON’T WAIT TILL TOO LATE TO BUY BARE ROOT FRUIT TREES. 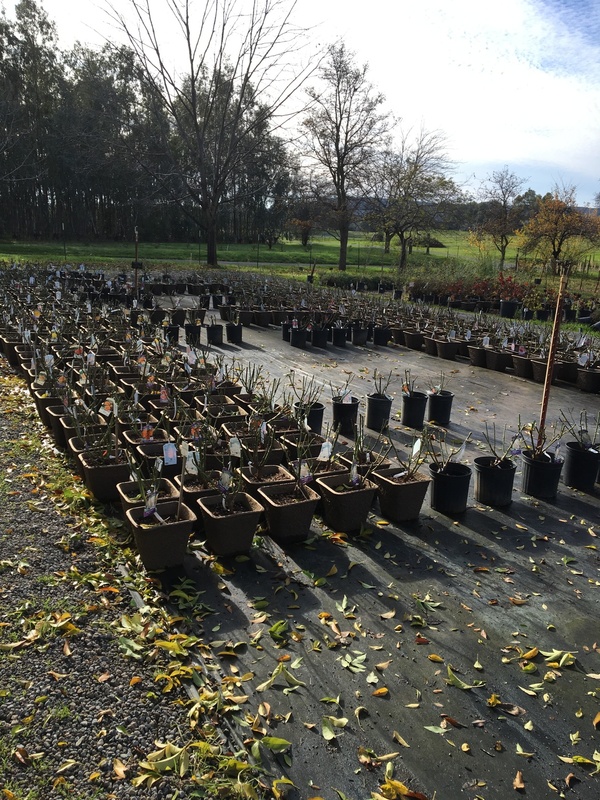 THE COOLER WEATHER IS KEEPING THEM DORMANT SO WE CAN EXTEND THE SEASON A LITTLE LONGER. ONCE WE POT THEM UP, THE PRICE GOES UP. 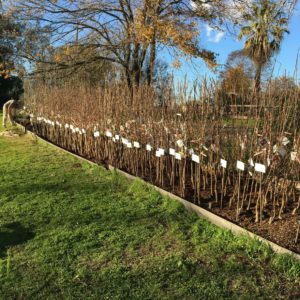 TAKE ADVANTAGE OF THE EXTENDED SEASON AND GET BARE ROOT FRUIT TREES NOW. March has started out a bit cool this year. Winter decided to come a bit late. It actually is still winter by the calendar until the 20th which is the first day of spring. Lots of nice rain to start off the month. My rain total for the winter up through the end of February is 15.25″ so far since October here at the nursery. As I write this, we had another 1.5″ overnight last night and more rain coming through Friday at least. Last year at this point we were at 38 inches for the same period. It is now time to get ready to start fertilizing.The rain is going to get the ground good and moist, and with the above average temperatures we had in February, many trees are leafing out. As soon as deciduous trees and shrubs have their full set of leaves, you should give them their first fertilizing of the year. A balanced fertilizer works well for most things. Use a rhododendron, camellia, azalea fertilizer for your acid loving plants. Fertilize azaleas and rhododendrons after they are done blooming. Same thing for camellias. Citrus should use a citrus fertilizer. Some citrus may have suffered some damage from the freeze we had last week. If you have that problem, I would suggest treating them with Superthrive. It will help them to get past the damage. Start fertilizing as soon as the danger of frost is past. I think it will be safe in another week or two. Most likely we are past hard freezes. Fertilize citrus monthly through the growing season. Speaking of citrus, we now have some of our citrus in and avocados are on order and will be in soon along with more citrus. With the late freeze we just had, I pushed the shipment back a week to be sure we are past freezes. I expect next week or the following they will be in. Call ahead to check. I will send out an email as soon as they arrive. We will have a nice selection to choose from. It’s a good time to plant seed potatoes now too. We have Red, Russet, Yukon Gold and Kenebec. They sell for $2.50 a pound. If you’ve never grown seed potatoes, they are very easy to do. And the potatoes you get when you grow your own are much better than the ones you buy at the store. To plant them, cut them into pieces with two eyes per piece. Let the pieces you cut dry enough to scab over the cut. Plant the pieces in the soil about 8 to 12 inches deep and add the dirt back over as they grow and even mound up as the plants grow. The roots under ground produce the potatoes. Roses in plantable paper pots. $21.00 each. Grade #1. Roses should be leafing out now. If you have not pruned back roses, it is still a good time to do it. If you have any that are really large cause of neglected pruning during prior seasons, prune them down now. Prune roses down to 12 to 24 inches tall with several strong canes left and an open center. Be sure to start spraying roses with a fungicide now. We have had a dry winter but we are getting rain now so don’t neglect to spray or rose diseases could get started. We use Neem Oil every two weeks here at the nursery on the roses to prevent aphids and fungus problems. It’s time to start fertilizing roses as well. Roses are heavy feeders. They should be fertilized about every 6 weeks. Use a rose food or you can use a balanced all purpose fertilizer as well. I use a combination of the two on my roses and it works very well. We will have vegetable starts in two to three weeks. As soon as we get a few warm days, we will have requests for summer vegetable starts. It really is too early to put them in now. We will wait a couple of weeks before we will be carrying them. Maybe longer depending on weather. The rule of thumb is to waittill overnight lows are consistently 50 degrees or higher and the ground is no longer cold to the touch. You can start seeds indoors now and you can start prepping the soil now. Add bone meal or oyster shell to the soil along with the vegetable fertilizer when you are prepping the soil. Bone meal adds phosphorous for root development and supplements calcium. Oyster shell adds calcium. Calcium will help to prevent blossom end rot. We also have calcium nitrate which can be added to help prevent it. I use organic fertilizer on my vegetable garden. I use bone meal and oyster for calcium and phosphorous, and tomato and vegetable fertilizer and kelp meal. Kelp meal helps to prevent diseases. About half way through the season I re apply fertilizer and bone meal. We will be having an organic vegetable gardening class on March 7th and April 8th. I will send out email reminders for that. We may also do one on the 17th and 18th if people are interested that early in the season. Please send me some feedback on when you would like to see those classes, or any other classes, and I will try to accommodate schedules as much as possible. The 24th and 25th are not available for classes since I will be at the Yuba City Home and Garden Show. If you were not able to get the dormant spraying done on your fruit trees because of all the rain, we do have a fungicide that works after the fact if you end up with leaf curl. It is made by Dr. Earth and it works well at curing the problem. One other thing to consider with fruit trees is the damage that occurs on nectarines and peaches. The fruit can be damaged by a bug when it is very small and then as it matures the damage grows. To prevent this, spray with neem oil or horticultural oil after the petals have dropped and you are sure the bees have finished pollinatiing. This should help to minimize the problem by keeping the bug that causes the damage off the small fruit that is forming. Be sure to fertilize your fruit trees when they have their full set of leaves. Use a balanced fertilizer of a fruit tree fertilizer. We carry both. This time of year, we start getting lots of merchandise in. Usually weekly or every other week we get things in. If there is something that you are looking for that we do not have, we can usually have it within a week or two as long as it is available. Lots of new stuff comes in regularly through the spring. Don’t forget daylight savings time begins March 11th. A note on our hours. We are open 9 to 5 Monday through Saturday and 10 to 4 Sunday. Bare root season continues through February. The selection of bare root fruit trees and roses is still very good. We had 8″ of rain in January with a dry start in February and it is an excellent time to plant bare root fruit trees. At the end of the month we pot up what has not been sold bare root and then the price goes up. 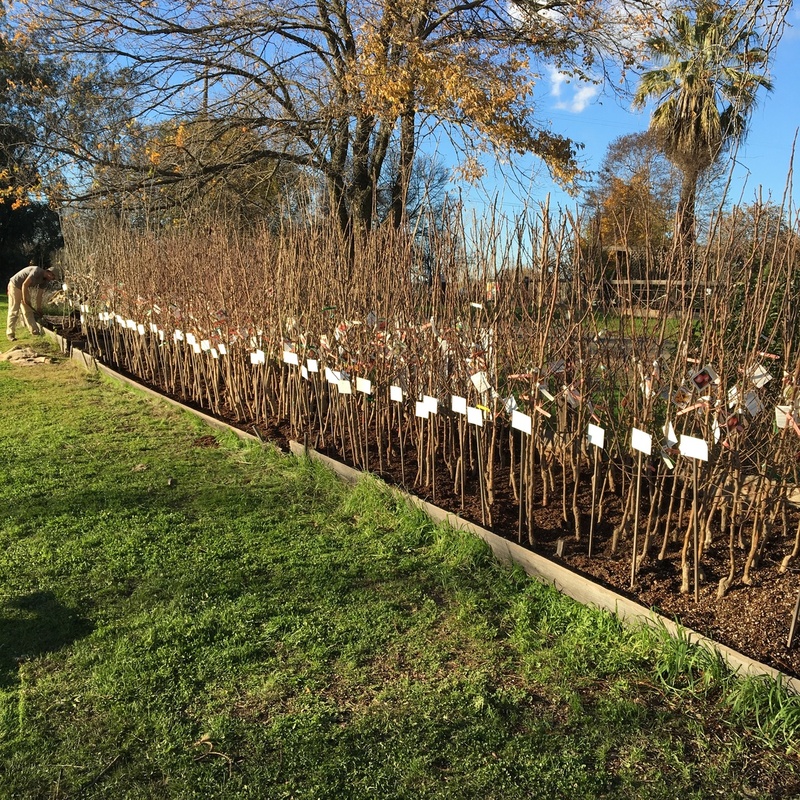 Take advantage of bare root prices and selection and get your fruit trees in now. The third and final dormant spraying to prevent leaf curl is due this month. Don’t delay. Get it done before the trees bloom. I spray all the deciduous trees in the orchard. It not only prevents leaf curl but it also helps to prevent fireblight on pears and apples and greatly reduces the aphid and insect problems on all the trees. The third and final spraying is the most important one. You should have done two applications already and the final one should be done before flowers come out. We sprayed the nursery orchard for the final time last week because some of the apricots were ready to bloom. Don’t put this off till it is too late. It will be time to start fertilizing towards the end of the month or early next month. When the plants come out of dormancy, it is time to start fertilizing. Evergreen plants can be fertilized as soon as the threat of hard freezes is past. So later this month. Use a balanced fertilizer on most plants. 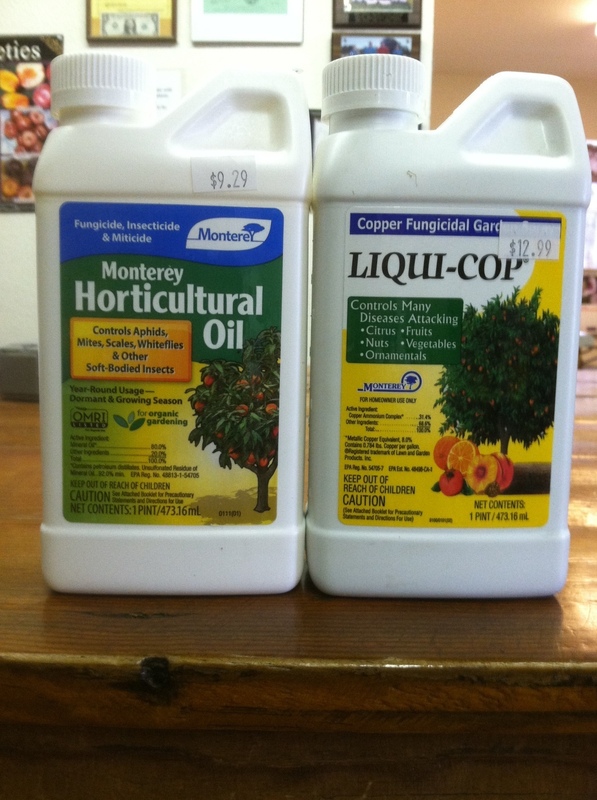 Use citrus fertilizer on your citrus. Use rhododendron azalea camellia fertilizer on azaleas and camellias after they are done blooming. Fertilize three times after bloom each thirty days apart and then no more for the year. Gardenias benefit from monthly fertilizing during the growing season.Use a rose food on roses or a balanced fertilizer on them and do them monthly during the growing and blooming season for consistent blooms. 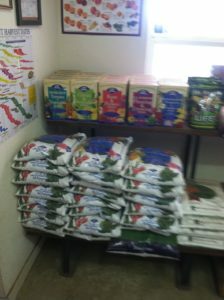 We have a good selection of fertilizers. Much of it organic fertilizers. Which I prefer to use. Weeds are going to start growing in earnest soon. You can spray with weed killer now to kill what is coming up now and mix pre-emergent with the weed killer to stop the weeds from growing back so quickly, I’ve been using a propane torch on weeds. It’s working well for me. Less chemicals. We will get spring vegetables in some time in late March or early April. Even though it’s warm in the day, it’s too early to start putting them out. The nights should be 50 degrees or higher consistently before putting your summer vegetables in the ground. If you are thinking about starting summer vegetables inside from seed, probably want to get them started soon so they are ready to put out in spring. Citrus we are starting to stock now and avocados are on order and should be in within a couple of weeks. It’s a little early this year but it seems as though we won’t have any hard freezes from here on. The forecast for next week cools down and overnight lows look to be in the upper 30’s to low 40’s. More like it should be. With the cool nights, the bare root trees are staying dormant and like I said earlier, it is the time to plant them. Once we pot them the price goes up and they are not immediately available, They have to root into the container before we sell them. GET BARE ROOT FRUIT TREES NOW.